It’s easy sometimes to get caught up in popular opinion, even if it isn’t necessarily true. For instance, there is the growing belief that the only multiplayer games anyone is interested in making anymore are shooters. While it’s true that many of the most readily available and popular multiplayer games are shooters, developers of this generation, perhaps more than any other, have really gone out of its way to create multiplayer games that don’t rely on shooting your friends in the face just to be entertaining. 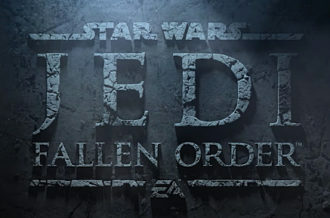 It’s time that those games got their well deserved attention. The only rules here are the game can’t be a shooter (obviously) and have to be on a current gen system, or be a PC game released roughly between 2006 and 2013. That type of timeframe means a lot of great had to be cut and, to help make those decisions, I really tried to focus on games that provided a multiplayer experience you couldn’t get prior to this generation. However, some exceptions do apply. It’s appropriate that Monaco’s graphics and gameplay hearken back to a late ’80s/early ’90s style of gaming, since it’s been about that long that gamers have been wishing for a heist game that doesn’t focus on the heist gone wrong and subsequent shootout, but rather the perfectly executed job. That concept is both the curse and crux of the Monaco multiplayer experience. Asking you and three friends to pick a crew of various expertise, Monaco demands a level of teamwork and communication that many other games shy away from. While there is an entertainment value to be found when things go wrong, this is a game that’s true worth only come through when there is some level of competence to be found amongst your ragged band of thieves. Thankfully, the incredibly accessible nature of the game, and the way it so generously doles out moments of instant gratification, make the shared pursuit of the perfect run not a frustrating proposition that only yields its rewards upon completion, but a journey filled with a series of those little moments that define any great multiplayer experience. Monaco may not look like the multiplayer heist game we always envisioned, but it certainly feels like it. 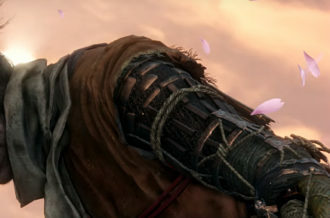 The collective groans of the Assassin’s Creed faithful heard upon the announcement the game was getting a multiplayer mode were not only noted, but honestly were not without merit when considering gaming’s long history of tacking on multiplayer modes to games best left as single player experiences. While that could have easily been the case here, thankfully the boys and girls at Ubisoft recognized the inherit potential of a multiplayer mode within this world, and executed it. Though consisting of several multiplayer types, the Assassin’s Creed experience is best defined by its Wanted mode which assigns you a player target amongst a sea of NPC’s, while another player has you as their target in the same scenario. While a deathmatch at it’s heart then, the Wanted mode cleverly incorporates a number of elements that made the series stand out initially, and uses them to provide an experience that requires quite a good deal more tactics and thought to excel at than the traditional shooter fare. We’ve been running around games killing our friends for years, but Assassins’ Creed was smart enough to really step back from the chaos that results in, and focus on the joy that comes from the hunt and moment of success instead. A bit of a cheat considering that Chivalry began its life as a mod to Half-Life 2, and thus retains many of the aesthetics and gameplay ideas of a shooter, it’s nonetheless impossible to single out games that think outside the shooter box without mentioning a game that in doing so manages to give us a game scenario that many have wanted for years. 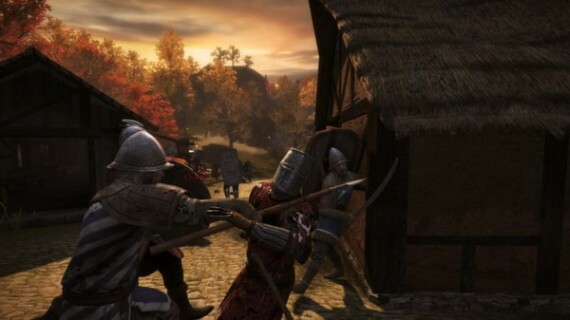 Chivalry is a medieval combat game that, for the most part, perfectly recreates the experiences of playing with and against your friends in a Braveheart style battle. Like Monaco did with the heist genre, Chivalry showed us that those years of wishing to participate in large scale medieval battles in video game form were not unfounded, as there is a visceral pleasure that comes with charging the field of battle with a large axe and watching limbs fly around you like leaves in the Fall. The enhanced focus on face to face combat drastically alters deathmatch dynamics, and forces you to create strategies applicable in few other games. Chivalry may have lifted much of its design from the standard FPS multiplayer, but cleverly uses that established context as a foundation that allows the developers to instead focus on the things the game can do that no others can. In that pursuit, it is a success that may have similar company, but no true equal. There’s a certain joy in the shared experience of gaming frustration. While there are specific parts or levels in our favorite games that make us want to tear our hair out in anger, we usually advert a meltdown when we discover that there are many, many others who are having the same difficulty. In these shared experiences, we feel a bond. Cloudberry Kingdom is a game that takes those experiences we used to share in just conversation, and allows us to actually play them together. Consisting of a series of random increasingly difficult 2D platforming levels, the feather in Cloudberry’s cap is it’s four player mode which takes these already near impossible challenges, and makes them even more difficult now that you have to work with your friends to complete them. The result is, usually, pure unadulterated madness. Whereas this same set up can be annoying in games like Battletoads, here the die and die again as a result of your friends method is embraced with a level of carefree joy that matches the game’s initially confounding visual design. Cloudberry Kingdom’s multiplayer sessions are some of the best bonding experiences out there, despite the fact you’ll spend most the time with them resenting everyone around you. 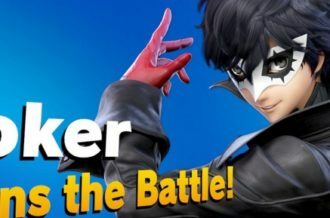 The popular tag line of any game that aimed at mainstream appeal is usually something along the lines of “It’s so good, even grandma will play it!” While that’s of course a sensationalized vision that most games never achieve, as a lifelong gamer whose actually played Wii Sports with his grandma (and been soundly beaten by her at it) I can say it holds no hyperbole here. Scoffing at motion controls is the well deserved cynical right of any long time gamer. However, for as maligned as the whole idea eventually became, during the glorious, shining moment you first played Wii Sports with friends, it seemed on track to become the inevitable future. 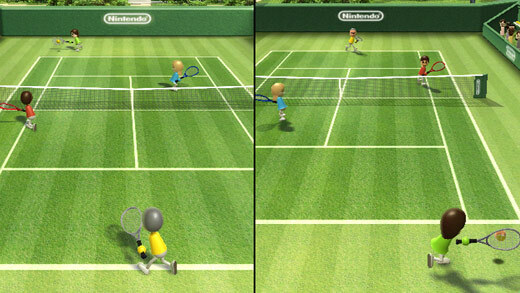 Wii Sports was nothing short of pick up and play perfection, with appeal that goes from curiosity to party game phenomenon the moment you actually try it. It used the innovation of motion controls to tap into a primal level of game enjoyment that many of us though we’d abandoned with experience and maturity years ago. Wii Sports may be good enough for Grandma to play as advertised, but what’s most amazing about is not it’s ability to ensnare the leisure time of the elderly, but rather how it created an experience that can be enjoyed on an equal level amongst all who play it. Unlike other games on this list which are notable for thinking outside the box in terms of multiplayer experiences, upon initial glance there’s not much new about Castle Crashers, which appears to be another in the line of multiplayer 2D beat em ups that used to rule the arcade. Meanwhile, actually playing the game the first time reveals…pretty much the same conclusion. However, there is a big difference between making an old school game for the purposes of invoking nostalgia, and making one that actually recreates the feeling of playing that game back in its prime. 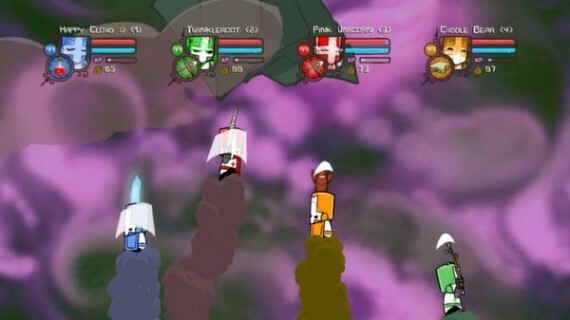 Castle Crashers is an example of latter, as it rightfully focuses less on re-inventing the brawler wheel, and more on emphasizing what made it so much fun in the first place. Of course, the little unique touches such as mini-games and RPG-lite elements are certainly unique and well appreciated additions. 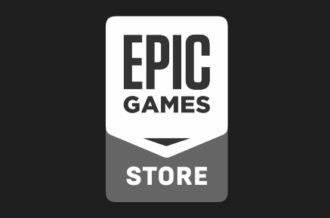 For the most part though, the appeal here stems from getting together with your buddies and enjoying a satisfying brawler with a tightly designed combat system, and bar none some of the best level design of this generation. The multiplayer portion may only last you a couple of hours or less, but is worth revisiting several times for the simple pleasures it provides. Simply put, this is an example of old school beat em’ ups at their very best. This may be a cheat, but I didn’t want to single out one MOBA like League of Legends, and fuel the ongoing debate of which of these series are better, when really the only intention here is to focus on how great this entire genre is. As such, this entry goes to all you fine MOBAs out there. If competitive gaming ever really make it as a widely accepted form of entertainment, it will be in large part thanks to the contributions of this strange RPG, action, RTS hybrid known as the MOBA. It’s origins date back to the previous generation, but its influence and prime really began in earnest during this one, as this charming genre mutt quickly found its way into the hearts and hard drives of some of the best gamers out there. Impossibly deep and begging for hours and hours of practice to become even marginally competent on a professional scale at, the MOBA is perhaps the most significant thing to happen to competitive gaming since the FPS. Despite all of that, under the proper circumstances, this is still a genre that’s very easy to pick up and play, which is perhaps the most important part as it ensures that years and years of gamers to come will find themselves drawn to this intriguing blend of strategy, skill, and luck, just as centuries of people have found themselves drawn to a game of chess. Much like Assassin’s Creed, I wasn’t constantly thinking “Wow! What a great multiplayer game this would make!”nwhile playing the original Portal. In both cases, it wasn’t so much a lack of potential for a multiplayer experience that turned me off the idea, but rather the thought of how easily things could get screwed up if not handled carefully. Of course, as is the case with most worries involving game design and Valve, those fears would turn out to be completely unfounded. The brilliance of Portal 2’s multiplayer is not in the way it expands Portal’s dynamics by incorporating an additional player and an extra pair of portals to play with, but rather how it’s designed for and around the more organic qualities of the basic multiplayer experience. For example, even though the game requires intense communication, recognizing that many gamers do not have and don’t want to use a microphone, it incorporates a very effective, yet basic, non-verbal communication system. There’s also the way that it seems to know that you’re going to be spending a lot of time trapping your friends in portals, and encourages that playfulness by taking some of the things you learn in doing so, and making them solutions to the more complicated puzzles. At its heart though, what they did is take a game that was capable of making even non-gamers stop and have a look and translated it to an experience that allows you to invite that other person to join without sacrificing any aspect that made the original game great. In other words, Portal 2 in co-op is the definitive way to experience one of the landmark games of this generation. You may notice, at least as my personal preferences go, that many of the games which don’t encourage you to gun your friends down, instead emphasize actually working with them. Nowhere is this more obvious than the multiplayer in Minecraft. The difficult thing in talking about and analyzing what makes Minecraft’s multiplayer so great is that there is no definitive multiplayer experience. Some people use it to work together and create impossibly detailed and beautiful creations, while others create game within a game scenarios to compete in, and some still are perfectly satisfied with running around and killing each other. Like just about every other aspect of the game then, the experience here isn’t one pre-determined by the developers, but rather one that is uniquely yours based on who you are, whom you play with, and the extent of your combined imaginations. Regardless of how you play though, there is hardly a session of Minecraft multiplayer that doesn’t produce some kind of scenario or situation that you simply will not get in any other game. It may not do much more than throw more people into the Minecraft world, but then again really doesn’t have to. What? A game from the music genre is number one? Didn’t everybody stop caring about those years ago and only think of them when they stumble upon a plastic instrument somewhere in the back of their closet? Yes, that’s very true, but I find that as the years go on, I look at the music genre more and more fondly, and miss it’s contributions and capabilities. Of those contributions, none were greater than Rock Band. In fact, you could argue that a big part of the reason the entire genre seemed to disappear so quickly is because there was no way you were going to top Rock Band as far as advancing the genre is concerned. It didn’t matter who you were or your thoughts towards video gaming, the feeling of getting four friends together and rocking across the globe with the help of a massive list of classic hits had an appeal that could seize infinite nights and weekends away. Many games work endlessly to pursue that level of zen that accompanies the perfect multiplayer gaming experience, but Rock Band manages to mass produce that euphoria to the point where you almost become burned out on it like a raging weekend drug bender. The heyday of music gaming may have come and gone, but even if it was ultimately just a fad that we were all caught up in (which I don’t think is the case), it would do absolutely nothing to tarnish the memories of nights spent playing Rock Band with friends, nor can it ruin the fun still to be had in getting the band back together for one more tour.